The holidays are here and we know our women love their diamonds, but sometimes we need to mix it up. I know that my wife loves the gift of time, but let’s face it, I can’t give her the gift of time, because there are only so many hours in the day, but I can give her a watch so she can at least try to make some time for herself. Watches are like a fine wine, as they age, some of them actually get better. I am a firm believer that buying a new watch is great if you can get your value out of it at a later date, but I also know that buying a new watch is generally not the smartest move. I encourage all my customers to buy a used watch, and if you trust the source you are buying from and can get a warranty, then you are golden. When you purchase a mid to high end brand, such as Rolex or Bertolucci, the models don’t change much year after year, so you are just as safe buying a used model as a new model, and you save lots of money by buying used that has been reconditioned and can last you a lifetime. Bertolucci 18 Kt. Gold Watch with Gemstones – Bertolucci imposes a distinctive style by bringing a unique association of Italian Inspiration & Swiss Know-how into watch making. To enhance the elegance and the exclusivity of the watch, Bertolucci’s designers let their creativity go by setting precious gems into the case, bracelet or dial. This watch has Diamonds in the bracelet and Rubies on the dial. Rolex DateJust – Classics never go out of style, and the Rolex Ladies DateJust stands the test of time in more ways than one. This watch will truly give her the gift of time, whether you give it to her in all gold, stainless and gold or stainless, choose a polished band or a jubilee band, she will sure to give you plenty of Christmas cheer under the mistletoe after she opens this! 1940S Rolex Rolesor Bubbleback – The Rolex Bubbleback’s unique name comes from its protruding case back, which bulges in order to accommodate the thick movement and rotor that turns on a pivot, powering the winding of the mainspring. The first Bubbleback made its appearance in 1933, and the watches were produced for only about twenty years. The Bubbleback helped establish Rolex as a brand known for its reliability, and these watches certainly are reliable—as evidenced by the relatively high number still functioning today. Bucherer Vintage with Diamond Bezel – Bucherer watches have been manufactured for ninety years, and are still being manufactured today. The attention to detail and uncompromising quality make every Bucherer watch an object of lifelong pleasure. Rolex Oyster Perpetual – This is the most recognized of the Rolex brand as well as the first successful waterproof case for a wristwatch, patented by Rolex in 1926. It was the Rolex Oyster and later Rolex Oyster Perpetual models that made the Rolex reputation for excellence. The Perpetual was the Oyster combined with an automatic winding mechanism that was wound by the wrist motion of the wearer. 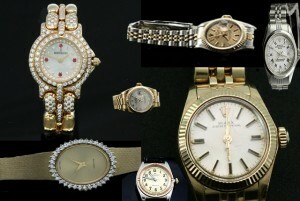 The Oyster waterproof case was the basis for all of the subsequently successful models, and a great used watch to own. Once again, I wouldn’t leave you out in the cold, because we happen to have all of these watches available to you in our eBay store. In fact, go and take a look at our selection of men’s watches as well, you might want to pick yourself up a little something too!